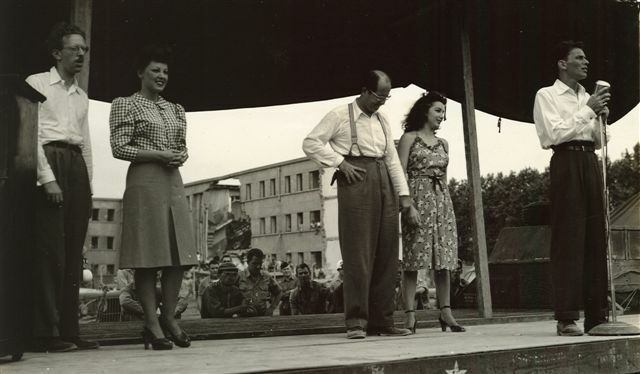 You will see attached [above] photo of Phil Silvers with Frank Sinatra on the USO tour in Pomigliano, Italy on July 1, 1945 performing for the 515 Air S.V.G.P. (Air Service Group). The far right is Frank Sinatra, then I believe is Phil Silvers' first wife, Jo-Carroll Dennison (Miss America 1942, whom he had just married), and then Phil Silvers. From any sources available or anyone checking from Phil Silvers book This Laugh Is On Me, are the two other individuals' names known ? Can anyone confirm that the lady next to Phil Silvers was his wife, Jo-Carroll ? The photo (along with a couple others of this USO Tour) is from my deceased father, USAAF Capt. Harry Kershaw, who was in charge of the entertainment coming to the base. To answer a question about who the two females were in the picture with Frank Sinatra and Phil Silvers. The one next to Phil Silvers is definitely not Jo-Carroll Dennison. And the one on the left is indeed a singer. Her name was Giselle McKenzie, and I remember her from many listenings to the Hit Parade back in either the late 1940s or early 1950s, maybe both. It seems to me that I remember that she was Canadian. I live in London and have heard that sometime they advertise the BOX set of Bilko on TV but you have to order it by CC card on the hot line number and it is not available in the shops. Can anyone tell me if this is true and better still does anyone have the name of the company. I really enjoyed the episodes of Bilko that I was fortunate to see. His performance in Its A Mad Mad Mad Mad World (my favorite movie) is classic. I would love to know when they plan to offer a boxed set of DVD's of Sgt Bilko. Please let me know! Thanks for the laughter . . . .
to whoever may read this................ 30 years ago after i graduated from high school, my buddies and i would get together and roar with laughter at the phil silvers show. dates with our girlfreinds were broken, band practice was ignored, etc. etc. etc. i think you get my point. now as we approach middle age, and a yearning for the simpler less hectic times of our youth.........all of us are searching hi and low to find out where we can purchase video or dvd libraries of the greatest comedy show of all time. can you point me in the right direction? I am interested in finding information on actress Elizabeth Fraser, one of the co-stars of the Phil Silvers "Sergeant Bilko" show. I am an old friend of her daughter, Liza Mc. Donald, and am interested in reconnecting for old time's sake. Liza and I worked together in the 70's at an art service studio in Los Angeles, and lost touch in '89. My name is Mary and I'd be delighted to hear from her. Thanks ! just saw your lovely Phil Silvers website. I have all the BILKO episodes on tape (apart from the 1 hour special he did). One thing I would like to see repeated (or released on video/DVD) is the very rare NEW PHIL SILVERS SHOW. Who owns the rights to this - do you know if there might be some sort of release (I am able to buy/play NTSC material). Hi My all time favourite show on early TV in Australia was "Sgt Bilko". Phil Silvers was the greatest comedian and character actor I have ever seen. To my great delight one of the series is currently being re-run nightly on cable in Australia, but at 11.30 pm. Do you know where I could buy the complete set on videos or DVD? Where can I hear Sgt. Bilko say "Glad to see ya!"? Note: Does anyone have a .wav file of this? I live in the Chicago area and have a few of the Bilko shows and would like to get more so my questions are where in the U.S. are they playing and are there any DVDs of his shows? Can you tell me who the actress was that played the socialite, Joy Landers, in the first season episode of The Phil Silvers Show entitled, Mardi Gras? Note: Two fans responded: Joy Landers was played by actress Contance Ford. Hello -- I'm looking for information about Phil's writers for the various shows, particularly Wynn Wright. Anybody know where I can learn more about him? I would like to get a copy of the Ed Sullivan Show guest appearance of Phil Silvers where Phil tried to teach Ed Sullivan how to "loosen up" as a host and smile in a more relaxed manner. Do you know the date of the Ed Sullivan show on which he did this? Hi, Can you tell me if Phil Silvers ever recorded a song called 'Woodman spare that tree', it's a song about a slippery elm ( I think) tree and goes something like - 'There is a tree near my house, it is a slippery elm', I am looking for the lyrics but this is all I can remember of it, any info would be gratefully received. REGARDS Malc.F. Yes, his Hollywood Walk of Fame star is at 6370 Hollywood Blvd. He was honored posthumously by it on November 1, 2000. Attending the ceremony with Phil's five daughters were comedians Jason Alexander and Red Buttons. Click here for more information. Click here to lookup all stars. Can you tell me if there is an autobiography or a biography on Phil Silvers? if so could you give me the books details. Also had the actor that played Sgt. Ritzig been in any other shows/films? With regards to Rob's question about the Phil Silvers' biography. The man himself wrote "The Laugh is on Me" and I believe it was published in the early 70s. It is very difficult to get hold of now though. I do not think anyone else has written a book on his life. Phil Silvers wrote an autobiography entitled "This Laugh is On Me", published in 1973. It is since been out of print but I'm sure that many libraries and/or old bookshops have the book. Keep your eyes out for it! Joe E. Ross, famous for the character of Sgt. Ritzik on "The Phil Silvers Show", is also famous for immortalizing the character Officer Gunther Toody on "Car 54, Where are You?" starring Fred Gwynne and Beatrice Pons(Emma Ritzik). Also created by Nat Hiken. Joe E. Ross also had a small part in the Disney film, The Love Bug.